Chatsworth Park covers 1000 acres and is enclosed by a 15km long dry stone wall and deer fence. The park is a farmed food producing landscape and is home to red and fallow deer, sheep, cattle, game birds and many other wild animals and birds. The 200 acre Old Park is a Site of Special Scientific Interest and is kept private to protect wildlife. The Park is an excellent open area for easy walking with fine scenery, woods and views of the house and surrounding area. It is also excellent for relaxing with a picnic or enjoying a meal and a drink in one of the cafes or restaurants. There is a farmyard, fees apply, behind the house where typical farm animals can be seen and demonstrations of milking and other insights into life on a farm take place. Next to the farmyard there is a small adventure playground. Car park fee at Chatsworth is £3. Chatsworth House sits on a raised terrace on the eastern side of the park overlooking the River Derwent and backed by a steep wooded hillside. The magnificent yellow stoned house is surrounded by gardens and is a very popular tourist attraction. The original house was built in the mid 16th century by Sir William Cavendish and his third wife Bess of Hardwick. When Sir William died in 1557 the house was partly built and Bess completed the house with a central courtyard and four corner towers which cannot be seen today but the modern hose retains many of the Elizabethan interior walls. 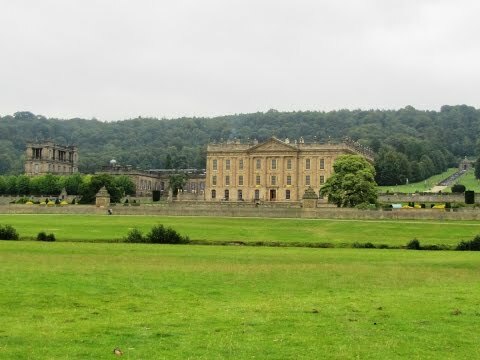 Between 1686 and 1707 the first Duke of Devonshire rebuilt Chatsworth in Classical style. The park was landscaped by the 4th Duke who employed Capability Brown to reshape the formal garden into the more natural one you see today. Between 1790 and 1858 the library and North Wing were added by the 6th Duke and he engaged Joseph Paxton as head gardener who enriched the gardens, created the Emperor Fountain and also the Great Conservatory. The house and gardens have remained little changed to this day except that the Great Conservatory was demolished and replaced by a maze. Parts of Stand Wood on the steep hill behind Chatsworth have probably been wooded since at least medieval times. The Hunting Tower which is the most impressive building that has survived from the 16th century can be seen rising above the trees. The high tower built during the time of Bess of Hardwick is ideally situated on the crest of the hill thus providing extensive views of the deer park for locating deer and observing the hunting as well as being a place for banquets. Tradition holds that Queen Mary’s Bower was built in the 1570,s when Mary Queen of Scots was held at Chatsworth, in order to provide a raised exercise ground for the exiled queen. The Bower set in the formal gardens that once surrounded the house went under massive restoration in the 1820,s and the area around the building has been changed in many ways since the 16th century. The Mill built between 1761 and 1762 was designed by James Paine for the Duke. It was a replacement for the former working mill near the house. Originally an ornamented working building the mill was damaged by falling beech trees in the great storm of 1962. Duchess Deborah prevented the mill from being dismantled and had it made safe as a ruin, thus maintaining its architectural heritage to the landscape. Paine also designed the two bridges, One Arch and Three Arch. Three Arch Bridge built between 1759 and 1761 carries the main drive over the River Derwent to the main house and was positioned at an angle so as to be seen from the house and also to provide the last view of the house from the entrance drive. One Arch Bridge built between 1759 and 1760 is situated at the south end of the park with views north to Paine’s Mill. Its single rounded arch bridge reflecting in the river when the water is calm is a wonderful sight. Baslow just north of Chatsworth is the largest of the Derwent valley villages downstream of Hathersage and is very close to the northern entrance to Chatsworth Park. The villages of the Chatsworth Estate include Edensor, Pilsley, Calton Lees and Beele. Calton Lees is a tiny hamlet located close to the popular Chatsworth garden centre. Consisting of picturesque cottages set in a deep hollow in beautiful rolling countryside it is the estate’s hidden gem. Just on the outskirts of the hamlet there are two distinctive houses. Calton House is said to of been one of the birdcages where the sixth Duke of Devonshire, also known as the Bachelor Duke, entertained his lady friends. The Russian House, now a holiday let, is based on a model of a Russian Farmhouse sent to the sixth Duke by the brother of Tsar Nicholas I, who became friendly with the Duke when he was an ambassador to Russia. The Derwent Valley Heritage Way is a long distance footpath. The 55 mile way marked route starts at Heatherdene on the banks of Ladybower Reservoir and follows the River Derwent through the beautiful varied scenery of the Peak District National Park via Bamford, Hathersage, Froggatt, Baslow, Chatsworth, Rowsley, Matlock, Matlock Bath, Cromford, Belper, Darley Abbey, Derby and the UNESCO Derwent Valley Mills World Heritage Site along with many other historical interests until the Derwent joins the River Trent at Journey’s End near the historic inland port of Shardlow. The footpath can be enjoyed as a long distance walk or as a series of shorter walks. From the car park we turn left heading to the main road (B6012) where we turn right. We cross over the bridge and turn left at the bend in the road onto a small road with the gate house on our left. We follow the road up hill and after passing a farm on the right we turn left at the footpath sign. We head slightly right across the field to go through a gate and follow the path to the left uphill to go through another gate. At the track we turn left and then bear right to over a stile into the wood. We head forwards to a cross roads of paths and keep heading forwards following the sign for Robin Hood. At the t-junction the path ahead is closed so we turn left on a concessionary path diversion downhill into the wood. At the track we turn right and keep heading forwards on the track (only turning off to the left to view the waterfall and the Hunting Tower). After the Hunting Tower we follow the track bearing right signposted Robin Hood. After a short way we turn left at the footpath sign for Baslow. We head downhill through the trees to go through a gate then bear slightly right over the field to pick up the track we can see in front of us. We follow the track and turn left at the logs. We keep following the track and just before the car park we bear round to the right of Chatsworth House. We then head downhill to Queen Mary’s Bower and the River Derwent. We cross over the bridge and turn immediate left and head forwards with Chatsworth House and the river on our left. We keep following the river passing two weirs until we come to an old mill and two picnic tables. We turn right at the mill race follow the path to the road. We now turn left and make our way back to the car park. This is an easy walk on good tarmac, gravel and grass tracks and paths with one small section of road. There are some easy inclines and declines. Elevation: approx lowest point 105.4m (345.8ft) approx highest point 247.1m (810.7ft) approx total ascent 227.9m (748ft). Approx 5.3 miles allow 3 hours using OS Explorer Map OL24, The Peak District, White Peak area. This walk is anti-clockwise. Start point: Calton Lees car park just off the B6012 road from Baslow to Rowsley. Calton Lees is east of Bakewell and south of Baslow in the Peak District, Derbyshire. To avoid Sheffield city centre from the M1 take junction 36. At the roundabout take the 2nd exit onto the A61. At the main t-junction turn left still on the A61. On the dual carriage way turn right at the 2nd roundabout onto the A6101 at the end turn right onto the A57 towards Glossop and then turn left at Ladybower Reservoir onto the A6013. After passing through Bamford continue to the T-Junction. Turn left onto the A6187 for Hathersage. In Hathersage take the B6001 after about 2.5 miles turn right onto the B6521. Turn slight left onto B6001. Turn left onto A623 and follow this road to Baslow. In Baslow turn right onto the B6012 to continue to Calton Lees. The car park is on the right. Parking: Calton Lees car park £2 for all day. There are public toilets and refreshments at the nearby Chatsworth Garden Centre and also at Chatsworth House and grounds. Baslow is the nearest village with facilities.